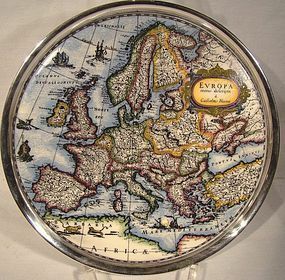 A 7-1/2" decorative porcelain trivet, stand or tray signed by Kurt Hammer, depicting a very old map of Europe with handpainted borders by Willem (Guilielmus) Janszoon Blaeu (1571-1638). This piece has been mounted in an 835 silver rim, and it has an applied wall hanging hook on the back. This item is in excellent condition with no chips, cracks, crazing, dents, bends, corrosion, losses, damage or repairs. All items are thoroughly and conservatively graded and all condition issues are noted; all items are vintage or antique and may have slight signs of gentle use. Small packet air shipping to the U.S. starts at $13.50 (other spots may vary). Items paid with a credit card will be shipped to confirmed addresses only. We do ship internationally. All of our prices are in $US. PLEASE NOTE: We DO NOT accept PayPal, only VISA and MASTERCARD. A colourful vintage Art Deco era 16-1/4 x 11-1/4" tin lithographed serving tray c1920-30. 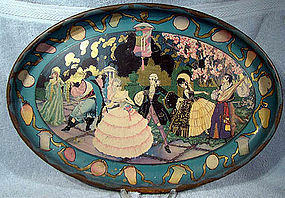 This unsigned tray has only a circled "c" copyright mark, and it depicts an 18th century outdooor masked ball. This item is in very good condition with no dents, bends, major damage or repairs other than some rust on the lower lip, a few spots and minor paint losses from spills and scrapes (all minor) and some loss to the back's gold wash. Overall the graphics are bright and colourful, and this would make a great display piece. All items are thoroughly and conservatively graded and all condition issues are noted; all items are vintage or antique and may have slight signs of gentle use. Tracked packet air shipping to the U.S. starts at $19 (other spots may vary) - insurance is included. Items paid with a credit card will be shipped to confirmed addresses only. We do ship internationally. All of our prices are in $US. PLEASE NOTE: we DO NOT accept PayPal, only VISA and MASTERCARD. 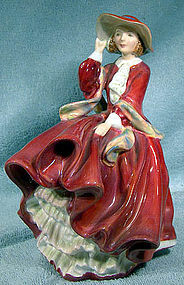 A vintage English bone china 7-3/8" Top of the Hill HN1834 figurine by Royal Doulton. This item is in excellent condition with no chips, cracks, crazing, losses, damage or repairs. All items are thoroughly and conservatively graded and all condition issues are noted; all items are vintage or antique and may have slight signs of gentle use. Surface shipping to the U.S. starts at $13 (other spots may vary) - insurance is included. Items paid with a credit card will be shipped to confirmed addresses only. We do ship internationally. All of our prices are in $US. PLEASE NOTE: we DO NOT accept PayPal, only VISA and MASTERCARD. 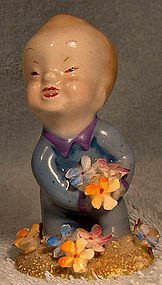 A Wade Wynken figurine 1948-59. This scarce 3" Wade figurine of the nursery rhyme Wynken character is in excellent original condition with no cracks, losses, damage or repairs other than a bit of chipping to two leaves of the flowers. All items are thoroughly and conservatively graded and all condition issues are noted; all items are vintage or antique and may have slight signs of gentle use. Expedited tracked and insured parcel shipping to the U.S. starts at $20 (other spots may vary, air is higher). Items paid with a credit card will be shipped to confirmed addresses only. We do ship internationally. All of our prices are in $US. PLEASE NOTE: We DO NOT accept PayPal. 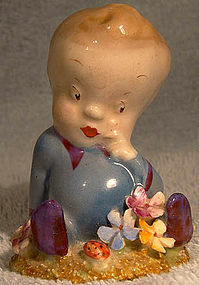 A Wade Blynken figurine 1948-59. This scarce 2-3/8" Wade figurine of the nursery rhyme Blynken character is in excellent original condition with no cracks, losses, damage or repairs other than a bit of chipping to two leaves of the flowers. All items are thoroughly and conservatively graded and all condition issues are noted; all items are vintage or antique and may have slight signs of gentle use. Expedited tracked and insured parcel shipping to the U.S. starts at $20 (other spots may vary, air is higher). Items paid with a credit card will be shipped to confirmed addresses only. We do ship internationally. All of our prices are in $US. PLEASE NOTE: We DO NOT accept PayPal. 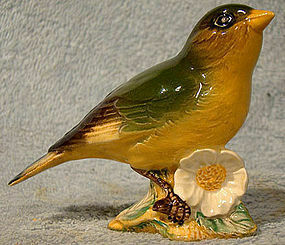 A Beswick greenfinch with flower 2105B bird figurine. This English bone china figure is called Greenfinch 2105 B. It stands 3" tall, and it is in excellent original condition with no chips, cracks, crazing, losses, damage or repairs. All items are thoroughly and conservatively graded and all condition issues are noted; all items are vintage or antique and may have slight signs of gentle use. Tracked Packet shipping to anywhere in the U.S. is $15.00 - this includes online tracking, air service and insurance up to $70. Items paid with a credit card will be shipped to confirmed addresses only. We do ship internationally. All of our prices are in $US. PLEASE NOTE: We DO NOT accept PayPal.